Nancy's Bagel Box is the downtown satellite store of Nancy's Bagel Grounds and has proudly served our locally made products for over 10 years. Our sweet little grab and go shop is situated inside what was once the Kentucky Theater, and gets it’s curious name because the space it occupies used to be a box office! We carry a unique variety of fresh baked bagels (made and delivered every morning at the Bagel Grounds!) as well as muffins, sweets, salads, daily soup, sandwiches, coffee, espresso, and many other specialty drink and snack options. 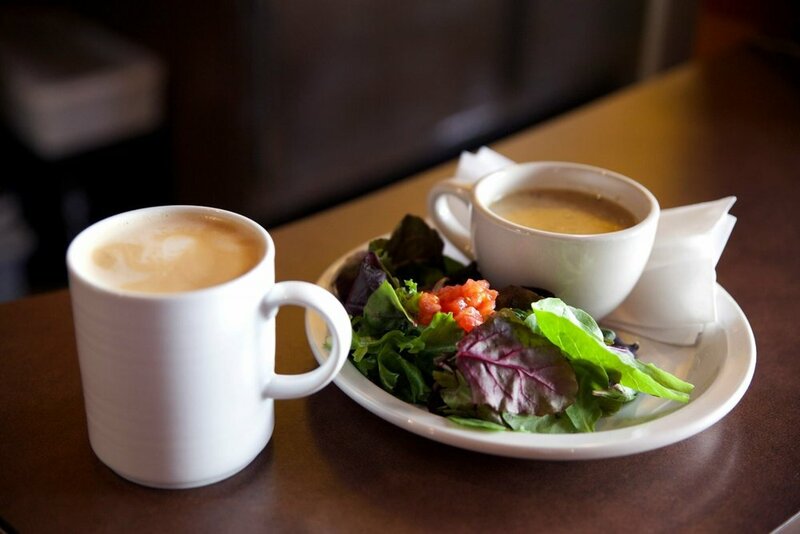 We’re a great spot for breakfast and lunch and afternoon treats to get you through your day. We're vegetarian and vegan friendly and can cater to many other dietary preferences. Stop by and see us....we're located inside the marketplace restaurant building doors, or you can stop at our street facing walk up window in the summer. We can’t wait to meet you! your work break coffee needs are guaranteed awesome because we use Sunergos Coffee and espresso. We have all the treats to get you through your day, from sweet or savory snacks, to a light breakfast and lunch options.